The look and say method teaches students to read words as whole units, rather than breaking the word down into individual letters or groups of letters. Children are repeatedly told the word name while being shown the printed word, perhaps accompanied by a picture or within a meaningful context. The method of teaching reading prescribed by Frank Smith(1:183-184),, who contends that to “ensure that phonics skills are learned and used” is one of the “12 easy ways to make learning to read difficult” obviously is the approach that has long been used by look-say reading teachers. Although Smith offers a lengthy, complex and intricate theory as to how children recognize words, which he calls the “feature-analytic alternative” to both the whole-word view of teaching reading and to phonics instruction, the teaching method he recommends is purely look-say. To teach reading, Smith (4:225). maintains, “All the teacher can do is providing the raw material, the written word, and its ‘name’’. This is a precise and accurate description of what has traditionally been called the look-say method. In traditional look-say methodology, the child is shown a word, is told its name, and then is instructed to say the word’s name. This procedure is then carried on or continued until the child can read supposedly by sight a large number of words. Based on definition above researcher can conclude that Look-Say method is effective in improving students reading comprehension because Phonics involves learning the sounds of letters. Students decode words by sounding them out or recognizing the word by sight. 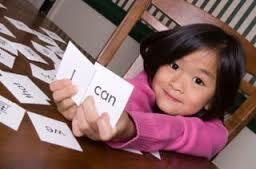 Phonics teaches students to associate certain spellings with certain sounds. Once children learn these sound-spelling relationships, they can come up with the pronunciation of words. The theory is that students need to become proficient at decoding words to quickly and accurately read them. Belum ada tanggapan untuk "LOOK-SAY METHOD IN READING"